Riding is very much part of the Fyling Hall tradition, and our eight horses and ponies are greatly loved members of the community. The stable-block lies within the school grounds, and the ponies graze the surrounding fields in summer, cared for by our B.H.S. registered instructor. 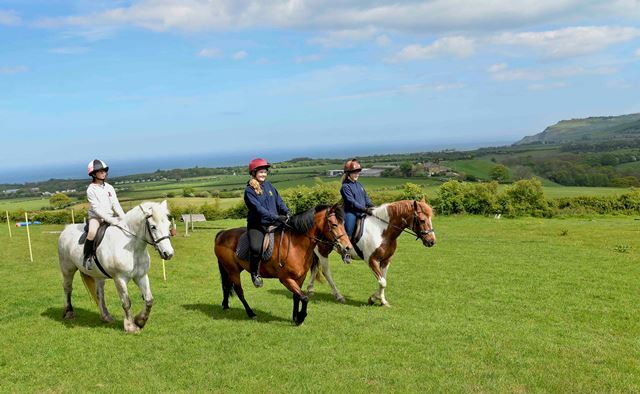 Over miles of beautiful moorland bridleways, pupils who have never ridden before can safely learn to do so, while those with experience can improve their skills under expert supervision. Riding is available for one (games) lesson a week, daily after school when the evenings are light, and every weekend. Our young riders compete in shows and gymkhanas round the county. There are outings for enthusiasts to bigger equestrian events – and while formal stable-management skills are taught to those with a keen interest, anyone who wants to help out with pitchfork or currycomb is also assured an enthusiastic welcome! 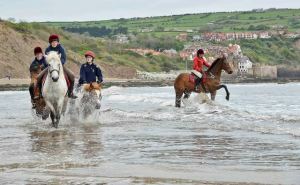 In summer 2005, four students and our riding instructor, Wendy Bulmer, commemorated the wartime evacuation of Fyling Hall sixty five years earlier by trekking on horseback 130 miles from Fyling Hall to Penrith.